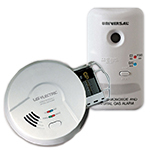 Meets New Laws & Legislations - This alarm exceeds industry standards, and is listed to UL Standard UL 217 and is California State Fire Marshal approved. 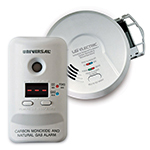 The USI Electric MCN400 Plug-In Carbon Monoxide and Natural Gas Smart Alarm is a 2-in-1 device that provides double the protection with a single installation. This dual-sensing alarm protects against two deadly household threats: carbon monoxide and natural gas (or methane). Perfect for new or replacement installations, the 120-volt AC alarm is suitable for houses, apartments and mobile homes. The compact plug-in design covers only (1) outlet for a fast and easy installation with no wiring required. This alarm features microprocessor intelligence to eliminate nuisance alarms, a single silence/test button to quiet a non-hazardous alarm and an end-of-service life warning that sounds when it's time to replace the battery (approximately 7 years from activation). Three LED colors display the status of the alarm, power, CO and gas in your home. The 9-volt alkaline battery (included) continues protection in the event of a power outage. 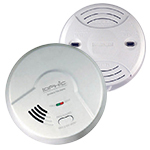 This alarm is ETL Listed to UL Standard 2034 & UL1484, California State Fire Marshal approved and Federal Housing Authority (FHA) approved to exceed industry standards. For maximum protection, install an alarm inside every bedroom, outside every sleeping area and on all levels of the dwelling. The USI Electric MCN400 Plug-In Carbon Monoxide and Natural Gas Smart Alarm comes with a 5 year limited warranty. Product Dimensions (W x H x D): 2.25 x 1.25 x 4.25 in. Easy to install--pull the battery tab and plug it in. A combination safety device which was a cinch to install and test. I simply trust that it does not alarm as it is designed to do. Thank you.